Liability Insurance provides protection to the insured in a variety of legal situations – it is designed to protect you in the event of being sued by a member of the public or by an employee. The concept of liability insurance is that if your company causes a member of the public or a customer any damage and they initiate legal proceedings against you due to your negligence, liability insurance will cover the cost of compensation to the third party. 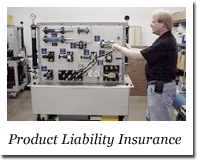 Product liability insurance is one type of liability insurance. It indemnifies the insured against all sums which the insured becomes legally liable to pay in respect of accidental bodily injury or illness to third parties, and accidental loss of or damage to third party property, arising out of the use, misuse, consumption, or handling of insured products or goods. In other words product liability insurance will cover your business in the event that any goods that you supply cause injury, illness, loss or damage to a member of the public. This ensures that risks are minimised, cash flow is not affected and losses are reduced.